Smaller versions of the customer favorites will be for sale, so people have a chance to sample food from several vendors. Remember that the food trucks are CASH ONLY, so you’ll want to make an ATM stop. 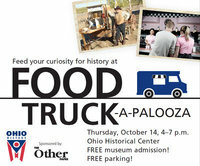 Museum admission will be free during the event but regular rates will apply beforehand from 10 a.m. – 4 p.m. Diners will be able to enjoy a slide show of historic photographs of Columbus street scenes. Afterwards visitors can see the museum’s exhibits, including The Nature of Ohio and Ohio: Centuries of Change. IMPORTANT DIRECTIONS: Due to an event at the Ohio Expo Center, 17th Avenue will be closed. We can be reached by taking Clara from 11th or by the 17th Avenue exit on I-71.